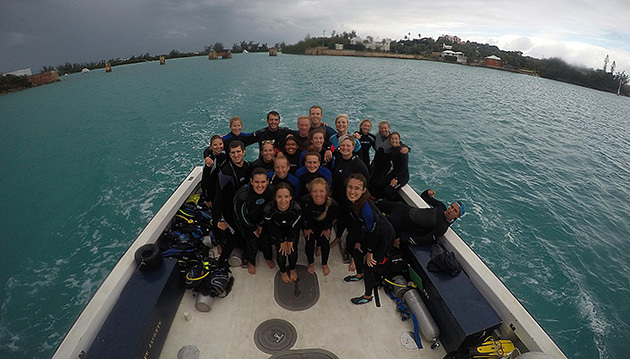 2017 fall semester class poses for a photo after a dive. 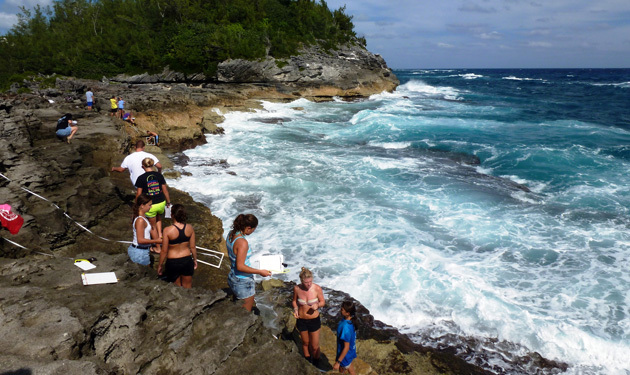 Students learn how to deploy a licor instrument during a lab for the fall semester Coral Reef Ecology course. The licor measures light moving downward through the water. Students used licor measurements to determine the loss of light intensity at various depths (also called the attenuation of light). 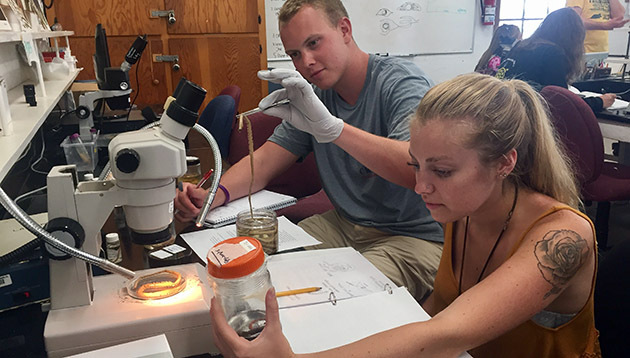 Students particpate in a marine worm lab for the fall semester Marine Invertebrate Zoology course. Fall course students from Roger Williams University and University of Rhode Island line up on the dock for an in-water demonstration of rescue diving skills. The Marine Invertebrate Zoology class conducts intertidal rocky shore invertebrate surveys at Spittal Pond. Ryan Woods and Whitney Jailley use a transect and photoquad to identify marine invertebrates on the North East Breakers reef. 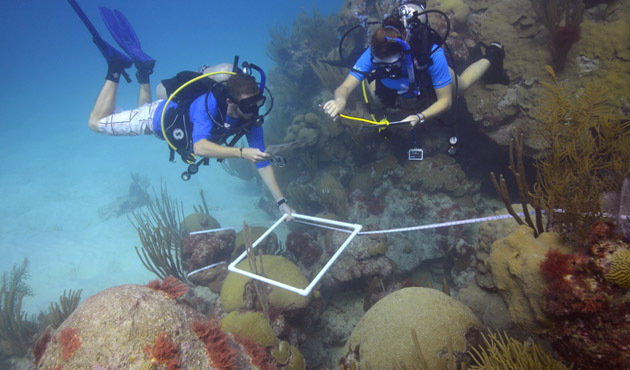 Immerse yourself in the study of marine science with a program of coursework and research that creates an ideal experiential learning environment. 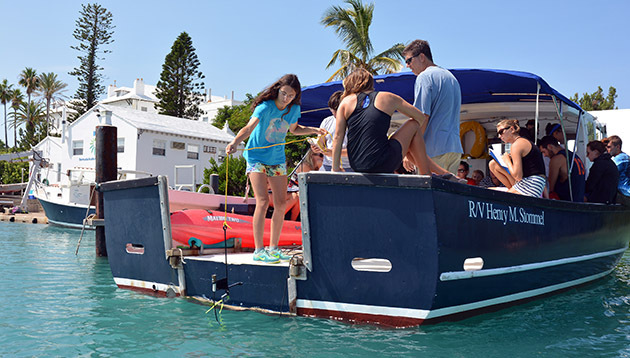 In addition to traditional class lectures and laboratory sessions, easily accessible and diverse marine habitats allow for frequent and informative field trips. BIOS is a residential community of faculty scientists, technicians, interns and students, and participation in the Fall Semester will expose you to what it's like living and working at an active research station. The 2019 Fall Semester Program will begin on August 26 and end on November 29; students are expected to arrive the day before the start of the program (August 25) and depart the day after the program ends (November 30). University of Rhode Island students should contact URI’s Office of International Education for the March application deadline and for more information. Roger Williams University students have an application deadline of March 1 and can contact Kevin Hayden (Director of Study Abroad Programs; khayden@rwu.edu) or Dr. Paul Webb (Biology Department; pwebb@rwu.edu) for more information. Additional information can be found here. Transfer credit for the BIOS Fall Program has been prearranged with URI and RWU to ensure their students receive academic credit. Students from other universities should ensure that they are eligible to receive academic credit from their own institutes for this program. Please contact education@bios.edu for further information. For those students enrolled at URI or RWU, please refer to your institution's relevant webpage and the university-specific information provided above. Students enrolled at universities other than URI and RWU are admitted subject to availability of spaces. The Fall Semester application form can be found here. Please complete and return to education@bios.edu. All students must download the Student Diver Information Packet. and complete all necessary forms and waivers prior to arrival in Bermuda. Please note that dive medical forms can take time to complete. For more information contact the BIOS Dive Safety Officer, Alex Hunter. Please read about Fall Semester Fees. Foreign nationals traveling to Bermuda do not require an entry visa. However, proof of residency or a valid Multi Re-Entry Visa for the USA, UK, or Canada may be required for non-US/UK/Canadian citizens, depending upon your country of origin. Please review Immigration Information to check the Bermuda Department of Immigration requests. BIOS does not provide medical insurance. All students are required to purchase an overseas medical insurance policy and ensure they have adequate medical coverage. You can SCUBA dive and receive academic credit for it. You will spend 4 weeks focusing only on research, which is excellent preparation for future research internships and/or graduate school. Students in past semesters have returned to BIOS on research internships to continue projects started during this program. You can interact with our NSF-funded Research Experiences for Undergraduates (REU) interns. They are one step ahead of you on the educational ladder and may offer valuable insights and advice as they are beginning to think about applying to graduate school. You may find future educational opportunities as a BIOS intern, or work experience as a Teaching Assistant for a BIOS course. Former Fall Semester students have gone on to publish their project results, in conjunction with BIOS faculty, in peer-reviewed scientific journals. You'll be spending 14 weeks in Bermuda studying a unique assemblage of marine environments that are easily accessible and ready for exploration.